Alright so here’s how it breaks down. Different stops will be having different activities, I.E. live music, free stuff and food for sale from 9 a.m. to 5 p.m. at Union Station, Little Tokyo/Arts District, Mariachi Plaza and the East LA Civic Center Station. Here’s a run down of what each station is doing courtesy of Metro. What: A special pre-holiday visit from Santa, who will appear with the Caroling Company, 1 to 1:30 p.m., in anticipation of his first holiday appearance in the 2009 Hollywood Santa Parade on Sunday, Nov. 29. Also at Union Station will be a display from Madame Tussauds Hollywood, as well as bands, guitarists and food booths . Last but not least, there are two non affiliated events that involve drinking and dancing. What started as a small effort to get a circle of friends together for the long awaited Gold Line Eastside Extension has turned out to be a party with over 100 Eastside enthusiasts! In preparation for the pub crawl, I called all the venues to make sure they are able to accommodate us. We only have one change and one “optional” addition. See below for revised schedule: revisions in capital letters. Meet us at any of the location based on your time availability. An eclectic and unrestricted night of music that pays tribute to the many musical genres that have and continue to influence creative generations of the Eastside of LA and beyond. Sunday November 15 more Roots Reggae music layering it with latin grooves…. This entry was posted in Uncategorized and tagged BOyle, boyle heights, Goldline, Linia de Oro, metro, Opening for gold line by El Random Hero. Bookmark the permalink. Oh right on cool..so is the “fat lady” aka Gloria Molina gonna make an appearance and sing too..I’m kidding but not really jejeje. 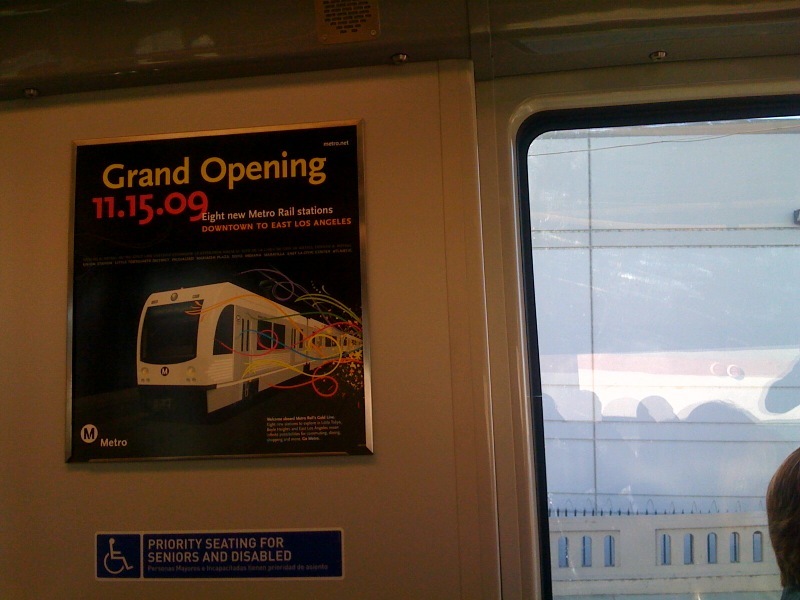 Im gonna wait until the 21st to take my first ride on the East Los extension…avoid the crowds,lookie loos etc. I plan to visit El Mercadito,Mariachi Plaza area and Little Tokyo. Not all at once in one day but different days and times. Im still old school i walk from South Park to Bunker Hill and Little Tokyo. And now pretty soon will take that walk from Historic Core to LA Live to check out the Regal 14. Thanks ERH for the info and a belated thanks for the DOD guide! I have to work Sunday but hope to be one of the early train riders and maybe make the pub crawl after work! I would suggest El Paseo over La Golondrina at ovlera st, El Paseo is larger, thus can accommodate more people and El Paseo is know for their large margaritas, though pricing is relatively the same for both places. You inspire me brotha. I’m going to try my best to be out there. I haven’t ridden a train in forever, but Sunday feels like a good time to get reacquainted. They should do this every week. You do realize it will be next to impossible to take the trains between stations due to the significant amount of riders expected that day? If you recall the Gold Line to Pasadena opening last, people had to wait hours for a train. I don’t see how you can do a pub crawl in any reasonable way without having to take buses or drive. It may be smarter to do it another day, because it won’t be likely. Dang, dudes! Y’all got RIGHT on it! I hope you all see the connection between the disappearance of the Breed Street food vendors the other day—after two decades, mind you!—and the opening of the Gold Line this coming Sunday. Suit yourself, LAtoAnaheim. More beer for us. Nah, I’m joking. Obviously you’re right. But drinking is 90% effort. Don’t ever underestimate a hundred or so people with a singular goal of getting drunk. BTW, I drove by the station at 1st and Boyle today, looked like they were still doing a lot of construction on the outdoor part. Will it be ready by Sunday? It really didn’t look like it. And it was drizzling, too. They looked like they were out there rushing. they have been going after the breed street vendors for a long time, prior to the gold line They are like the Davids in a David in Goliath struggle, but i dont see them winning the struggle anytime soon. God bless them for continuing there struggle and continuing to offer their ever delicious sopes and quesadillas. And in several years when the Regional connector ( http://www.metro.net/projects_studies/connector/default.htm ) is built eastsiders will gain further mobility allowing them to take on train that connects tot he blue line or expo line. This is monumental. It really is a big movement for the East side communities.. a very proud-full time. Everyone MUST come out to celebrate… no excuse!